We can solve any problem/conflict with squirrels. 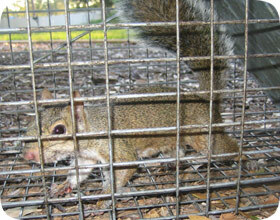 We not only trap them, but we offer a full line of complete solutions for squirrel problems. The Eastern Gray Squirrel is a very common suburban animal, and very successful, coast to coast. The female squirrels have two litters per year - one in August, and one in February. Within a month or so of birth, the young are large enough to run around. Squirrels love to chew their way into attics in order to have a safe place to give birth and raise their juvenile squirrels. Because they have two litters per year, these break-ins are common, and squirrels in the attic abound in Chicago. We humanely remove all the squirrels, and the young, and we seal up your home so that no more squirrels can ever enter the house again. We also frequently deal with squirrels that have either fallen down a chimney or are living in the chimney (able to climb in and out). We solve this problem in much the same manner as we do squirrels in the attic. Squirrel stuck in wall - It's not common for a squirrel to be stuck in a wall in Chicago. These animals are very agile and flexible, and climbing into tight spaces is something they do best. If you are hearing sounds inside the wall, it is probably just the squirrel chewing or scratching at the material. Like all rodents, squirrels need to chew constantly to keep their teeth at a reasonable level. Failure to do this would result in the inability to eat properly. Even loud squeaks and squeals are not usually a cause for alarm. The squirrels will squabble with one another. If the sounds continue for a few hours and sound distressed, then it is possible that the squirrel is stuck or injured. If this is the case, and you want to rescue the animal, the best thing you can do is call a professional. Homeowners are not always prepared to open up a wall and then handle a sick or trapped animal. Squirrels can and will bite when frightened. To help the animal, you will have to reach in and assist it. Without the proper protective gear, this will open you up to all sorts of potential injuries. While the wildlife removal company as at your home, it would be a good time to ask them for tips on how to keep squirrels out. Thanks do much David for your reply! I have a high roof and sofits covered with aluminum siding where they may have gotten in, so will have to depend on my roofers to do a good inspection, can't really see anything from the ground myself at this point. Also, which exclusion trap from that site do you recommend for Chicago squirrel trapping? I have grey squirrels. © 2003-2015 pestanimalcontrolchicago.com - site content, photos, & maintenance by Accurate Pest & Wildlife, all rights reserved.